Life in Writing: Reflections on "The Grove"
The Walking Dead isn't just an escapist drama about zombies and the apocalypse: it's a human representation of a world gone awry, and an introspective look at the self through situational horror. "The Grove", which is episode 14 of season 4, aired on March 16th, 2014. This particular episode touched on numerous difficult topics it has only briefly looked at in the past, fully developing a character whose illness has been hinted at since the beginning of season 4. A brief forewarning that this post is full of spoilers. If you're a Walking Dead fan who hasn't seen this episode yet, I recommend waiting to read this post. Lizzie and Mika, after the fall of Woodbury, moved to the prison with the rest of the series' protagonists. Shortly after, they lost their father, and were taken in by Carol. During this time, a few things occurred. Lizzie's fascination with walkers and naming them started to surface, and, in secret, she started feeding them mice and dissecting dead rabbits. Lizzie was clearly deeply embedded in a world of psychosis that her family was aware of. In one of Carol's early interactions with Lizzie, she calls her weak, to which Mika replies that "she's not weak", she's "messed up". Mika's reaction to Lizzie's panic attack at the beginning of "The Grove" was to tell her to look at the flowers, which was clearly a system that they had figured out a long time ago. Everyone's emotions were tampered with after the fall of the prison; everyone was affected differently by this event. Lizzie already was showing some distressing issues before the fall. It wouldn't have made sense for her situation to have come to a head before, as it was only beginning to develop. Lizzie had to grow up very quickly in a short period of time. With her father recently dead, she was the new head of the family, forced to care for her gentle and sweet younger sister, Mika. Lizzie shot two human beings, one in the head. While she clearly had issues long before that, that could easily have made matters worse. Lizzie called the walkers by names and was feeding them live mice. At this point, a fascination was beginning to take hold. When she was in Woodbury, she likely had access to anti-psychotics that would have withheld her condition. At the fall of Woodbury, and the death of her father, there was likely no longer a means by which she could access this medication. She dissected rabbits and captured the mice as her medication began to wear off, and that was when she started to "hear" the walkers. Picture taken from folieviolet on Tumblr. Could this have been avoided? Perhaps, but most likely not. The one part of the episode that seems to be the tipping point, though, could have been. At the beginning of this episode, we see a fire in the distance. Not long after, walkers, charred and smoking, appear. 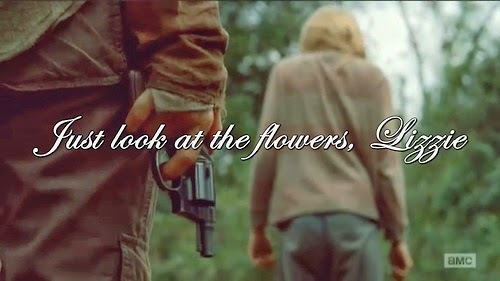 Lizzie joins the others to shoot the walkers and realises, then states, "I know what I have to do now". A few scenes later, Lizzie murders Mika. This wouldn't have escalated to such a degree if Lizzie wasn't forced to shoot the walkers. Without those walkers, the turning point of the episode wouldn't have occurred. Think back to a few episodes ago. Beth and Daryl decide to burn down the cabin they're resting in. This cabin is in the middle of the woods. I believe that the fire in "The Grove" was caused by Beth and Daryl burning the cabin a few episodes prior. If that fire hadn't brought the walkers over to the pecan grove, something would still have escalated with Lizzie, but it would have happened differently. Lizzie has a disconnect between life, death, and undeath, and seems to think that undeath is an evolution, of sorts, stating that she thinks she should "change", too. She has no trouble killing her own sister because she believes she is only helping her to change. She is still, however, a little girl seeking approval. She breaks down into tears when she thinks that Carol is mad at her, apologising for pulling a gun on her. She seems to realise that pain is bad, but doesn't think death is--as long as it can result in humans returning as walkers, made clear when she said that she didn't mean to shoot Alisha in the head. She meant to kill her, but didn't mean for her to stay dead. This episode was heavy-hitting in terms of character development for Carol. She has started talking about Sofia again, speaking easily and fondly of her, and even compares Mika to her. She has tried for the whole season to distance herself from these girls--to protect and guide them, without becoming a mother figure to them. In this episode, her failure in this is evident. She compares Mika to her own daughter, saying "she doesn't have a mean bone in her body" and that she would have to learn to make difficult decisions sometimes. When Lizzie is revealed to have killed Mika, Carol maintains her composure and only breaks down when Lizzie leaves with Tyreese. This scene was one of the best examples of the stellar acting the Walking Dead showcases every week. Carol knows she cannot let Lizzie live. She says twice that Lizzie "can't be around other people", betraying the significance of that statement the second time she says it. Carol has made an incredibly difficult decision. When she walks out into the clearing with Lizzie, the gravity of that knowledge is immense to her. She finally tells Lizzie she loves her, after resisting that love for the whole season, and quotes Mika's words from earlier in the episode, saying "everything works out the way it's supposed to". Carol has been keeping a secret from Tyreese since they met up: she killed Karen and David. In this episode, Carol has three chances to tell Tyreese what she did. The first opportunity certainly would have killed her, the second one was likely. The third time, Carol throws caution to the wind and tells the truth. Her development is immense here. She goes from being on her own and happy to keep the truth from everyone, to feeling a genuine need to tell the truth. She goes so far as to hand Tyreese the gun and say "do what you have to do". She accepts, openly, that Tyreese could kill her, and she wouldn't blame him for doing so. Tyreese, mercifully, shows a lot of development here, too. When he first found out about Karen's death, he would have happily taken care of the killer, no matter who it was. Here, he is able to see the situation from Carol's perspective, and accept that she really believed she was doing the right thing. The two leave together and continue to travel together at the end of the episode. After this episode, I read Of Mice and Men in full to get a better understanding on the comparisons being made by people online and on Talking Dead. With the episode fresh in my mind, the comparisons were clear, to the point that I'm certain Of Mice and Men was not only an inspiration, but that this episode, and Lizzie's entire character, was based on the story. The pecan grove Mika and Carol found is an ideal place for them to hide while they get their bearings. Tyreese believes they could find solace and be happy there, and for awhile, they are. This is a direct comparison with the run in which main characters Lennie and George were to "live off the fatta the lan'" in Of Mice and Men. The episode begins with them rejoicing in this place, much in the way that Lennie did when he imagined the run. Rabbits and mice are central in Of Mice and Men, and Lizzie kills these creatures throughout her tenure with the show. Lizzie nearly suffocates Judith in the same way that Lennie suffocates Curley's wife. Despite both characters' dark histories with living creatures, both of them share a kind of innocence; Lizzie plays with walkers like a little girl, and Lennie loves creatures like mice and puppies so much he kills them with giving them too much attention. Carol and George share a number of similarities: they are both the characters that hold power over the characters of Lennie and Lizzie, and act as guardians, of sorts. Carol is a mother figure to Lizzie, and a figure whom Lizzie wants nothing more than to please and impress. George is a sort of surrogate brother to Lennie--he keeps his behaviour in check and openly disparages him when he becomes out of control. Both Carol and George kill their surrogates in an act of love. They make the difficult decisions because they know their surrogates aren't meant to live in the world. Tyreese acts as a Slim-like character, offering Carol support after she kills Lizzie--and act that, though necessary, upsets her deeply. This was a moving, deeply upsetting episode. In my opinion, it was the best of the season so far, and is my favourite of the series to date. The writers did an admirable job in pushing the boundaries as far as possible while handling it tastefully. This episode ties some loose ends, such as the mice being fed to walkers and the dissected rabbits, and Carol finally was able to reveal the truth to Tyreese. With the textual parallels drawn between this episode and Of Mice and Men, as well as the walker-feeding harkening back to early on in the season, viewers are easily drawn to the conclusion that this ending for Lizzie was not only a long time coming, but that the character was designed to burn out brightly. The Walking Dead has always played with the idea that humans are more dangerous than walkers, and this episode illustrates that Lizzie feels that way to an extreme. Killing people and "changing" them into walkers means that they aren't intentionally cruel anymore. Finally, the way the actors portray their roles is spellbinding. Lizzie's crying during her final scene was one of the most heartbreaking things to witness in the series so far; most people I've spoken to have agreed that they didn't like Lizzie as a character, but that this scene made them feel genuinely sorry for her. The way Carol holds her composure until Lizzie leaves, then breaks down into sobs as she ensures Mika doesn't turn was a moment I won't forget. And, finally, the way Tyreese whispers "I forgive you" to Carol eased some of the episode's tension. This was, all-around, a haunting and poetic episode. Season 4 has been going all-out so far. I'm excited to see where the series will go next, with just 2 more episodes to go in this season.